There are over 50 soundscapes included which can be loaded with one click from the main interface. However the real beauty of Atmosphere Deluxe is the ability to customize these inbuilt soundscapes exactly to your liking, or create entirely new ones by adding individual sounds to a blank soundscape. As an example, if you load the ‘Oceans edge’ scenario you will hear the sounds of waves lapping on the shore, plus a gentle fire crackling and distant crickets. If you prefer not to hear the fire crackling, this can be turned off so you only hear the waves and crickets. Alternatively you may wish to add a sound such as a gentle breeze blowing through the trees along with the waves and crickets. You can add as many or as few sounds as you wish to create your ideal soundscapes. The individual volume of each sound can also be adjusted to suit your taste. You may save as many soundscapes as you wish and they will be ready for quick recall at anytime. 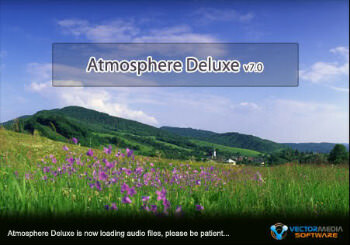 Atmosphere Deluxe is not just an ambience program which plays back soundscapes. In its default state the soundscapes will not change over time – For example if you choose ‘summer meadow’ scenario and leave the soundscape playing, you will still be listening to a summer based soundscape in 30 minutes, or 3 hours. However, you can choose to have the soundscape evolve over time, just like in the natural world. In this case your summer meadow scenario may evolve into a gentle rainshower and back again, or perhaps into a summer thunderstorm. You can choose the likelyhood of the weather changing, and the severity of the weather effect and leave the soundscape running and Atmosphere Deluxe will randomize the weather according to your settings and adjust the soundscape gradually over time, just like real world weather. You can also choose to have a daytime based soundscape evolve gradually into an evening and night based soundscape, again the change will happen very gradually just like you were sitting outside listening to the sounds of the real world. Although Atmosphere Deluxe comes with mainly relaxation and nature based soundscapes, it offers the ability to load in 16 additional background sounds and 32 random sounds at any one time alongside the inbuilt sounds, so if you have your own sounds you may load these into the program and use them in exactly the same way as the inbuilt sounds. We have many free expansion sounds and scenarios available from the Atmosphere Deluxe section of our website which vary from additional nature / relaxation based soundscapes to more urban soundscapes such as cafes on leafy boulevards and busy cities, so if there is a soundscape or individual sound you’d particularly like that isn’t included, the chances are it’s available from our website as a free download. There is an import feature within the application to import the add-on expansion scenarios with one click. Once you are comfortable with setting up your own soundscapes, you may wish to share them with other users of the program by uploading them to our website using the scenario exporter. Atmosphere Deluxe has two visual modes which you may wish to use. The first is slideshow mode which displays images which match the soundscape in the background. You can choose to use the inbuilt images which will change to match the currently playing scenario, or alternatively you can use your own images and create your own slideshows to accompany the soundscapes. The second mode is panoramic mode which scrolls panoramic images in the background as the soundscape plays. Again, you can choose to use the inbuilt panoramic images, and also select your own if you wish. We have many extra slideshows and panoramic images available to download from our website which you can use within the program. If you like to listen to ambience while away from your PC or wish to create sound tracks for your videos, Atmosphere Deluxe comes with an inbuilt recorder which allows you to create MP3 or Wav recordings of the soundscapes which can be transferred to CD or your Ipod or portable device to listen to anywhere. Atmosphere Deluxe has an inbuilt CD player and MP3 player so you can even add your own music to the soundscapes if you choose. Whatever you hear coming out of your speakers will be captured by the recorder so you may wish to choose your favorite soundscapes, add your own music from MP3 or CD and record the whole mix. Atmosphere Deluxe has a fully configurable binaural generator which can help adjust your brainwaves to specific frequencies which can aid with relaxation or concentration. If this is a new concept to you and sounds like science fiction don’t worry, there is actually a huge amount of scientific research to support it, and it’s completely safe. If you haven’t used binaural tracks in the past to enhance your relaxation experience then you may wish ready through the binaural section of the helpfile to fully understand how to get the most from this feature. Atmosphere Deluxe comes with a highly configurable scheduler which allows you to have the soundscape changed at a regular interval, or at specific times of the day. You can setup playlists with your favorite soundscapes and have them loaded at specific times automatically. For example you may wish to have summer based soundscapes playing during the afternoon, and woodland and nightime soundscapes loaded through the evening. You can save any number of different schedules and recall them quickly at anytime.